A Bird Hunter's Thoughts: That's good diesel! Gotta like QT!! Lowest price I've seen in many months. 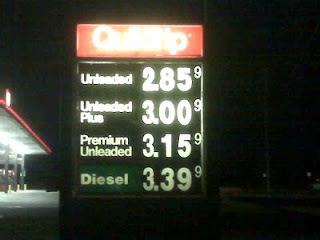 It'll only get cheaper as I move North. There's a Citgo across the street, but that's Caesar Chavez Venezualan oil and I won't buy that garbage if I can make it to any other place- sorry I'm so political.